Your wedding dress will remain a graphic piece that will highlight the most important day in your married life and reminds you of the best memories over the years, so it’s not only important to choose the most suitable for your radiant look in just one night, but to get unique touch on your wedding frames that is going to extend to the rest of your life. “What woman needs” brings you the latest and the most beautiful wedding dresses styles, and reveal to you about popular lines of the latest designs and the most important tips for the season 2019. This is known as the shape with a little skirt, with a line of the hips and thighs and layers below the knee. And it is considered the best for brides with hourglass body shape if you want to show the features of the curves of your body. but avoid If you do not want something tight. A natural line that shows your body in a straight vertical style, in a classic soft, is more appropriate for those who like to add length to her diminutive height. Try to avoid if your body is pear-shaped because it makes your appearance seems unbalanced. 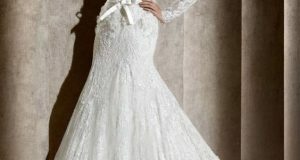 Make your dress seem like falling down gradually expands from the bottom, and is considered the best for brides who are proud of their central area because it hugs the waist and hips, this year emerged wonderfully in multiple and elegant models but avoid if your body shape is rectangle, it shows your body far fewer curves. It’s newer designs featuring with a skirt lined over it, and straight from the knee in a graded form, preferably for brides who prefer meandering shape, and it is easy to move when you wear it and avoid if your body shape is characterized by an apple or fullness.